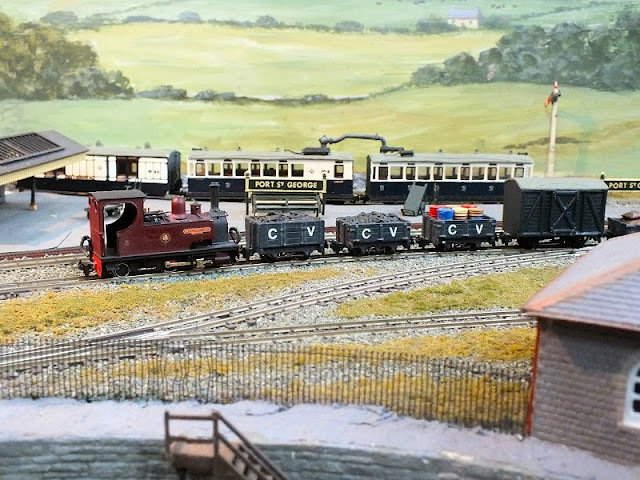 Following the successful Members Morning’s that Brian Guilmant had organised in 2012 and 2013, for this year he laid on a full day mini-exhibition with a selection of top quality invited layouts in 3 scales, both the 009 Society and 7mm NGA sales stands, a “drop in surgery” for sick items of stock provided by fault finding wizard Ian Turner and the usual superb refreshments provided by Muriel Guilmant and her team of volunteer ladies. 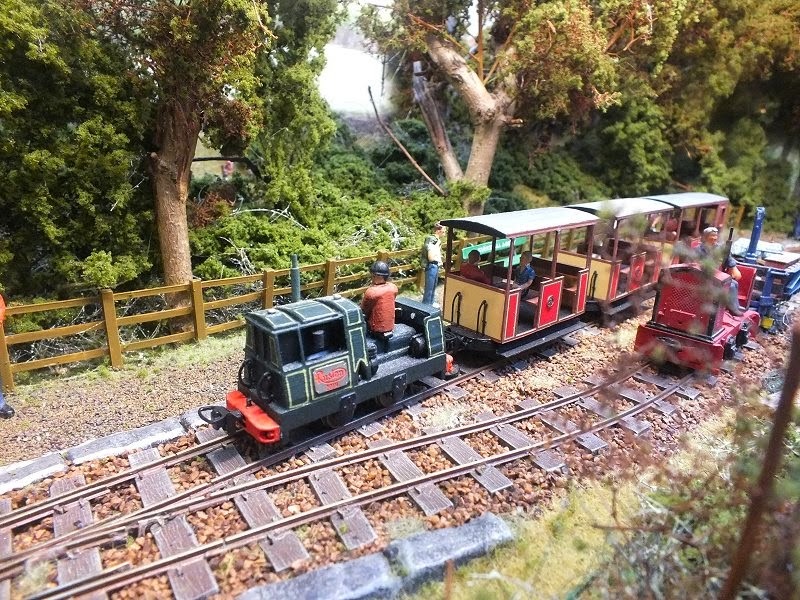 Once again, enthusiasts who know a good thing when they see it came from near and in some cases very far and including those who were participating, about 100 people enjoyed an outstanding friendly day of narrow gauge modelling fellowship. What a splendid way to round off another full year of these superb little informal events. 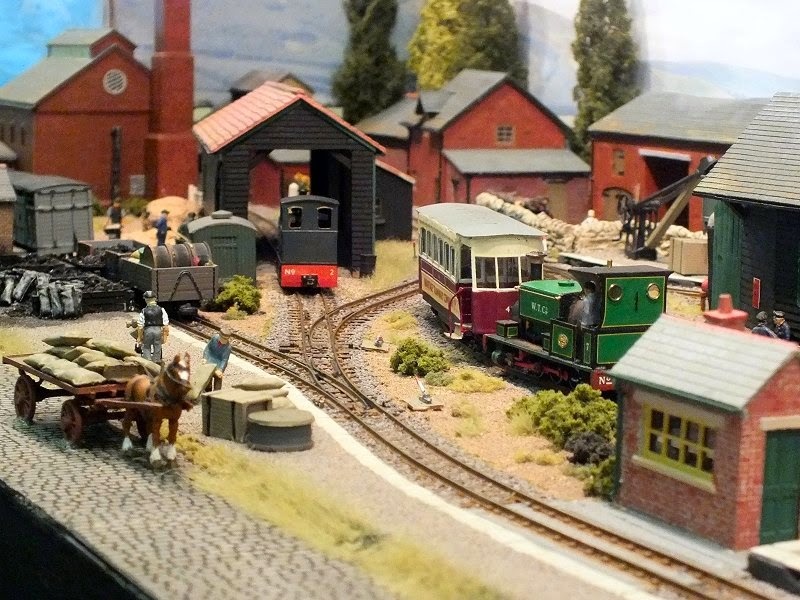 If you haven’t been to one yet, then make sure you do in 2015 – a much more enjoyable day out than you get at the big mainstream exhibitions! 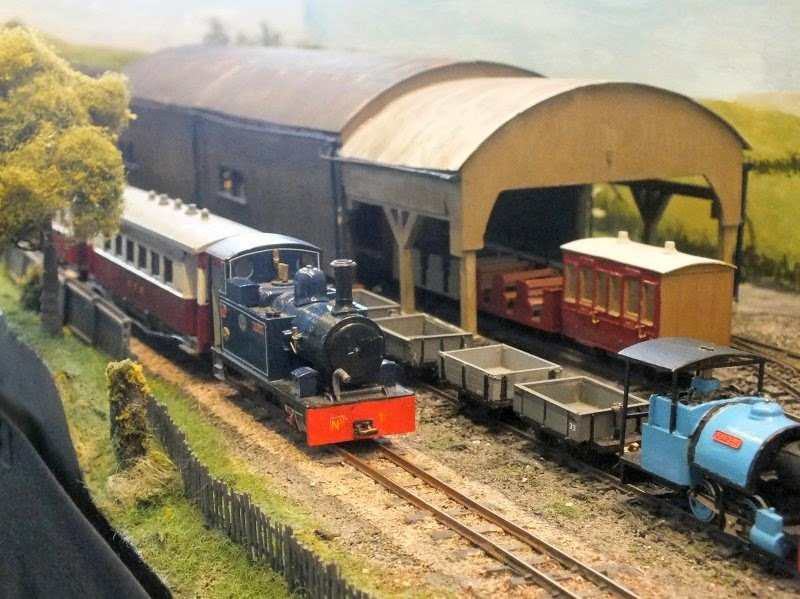 The Small & Delightful Railway Group are the small team of dedicated mainly Somerset based narrow gauge modellers that organise and host Narrow Gauge Southwest at Shepton Mallet every February. 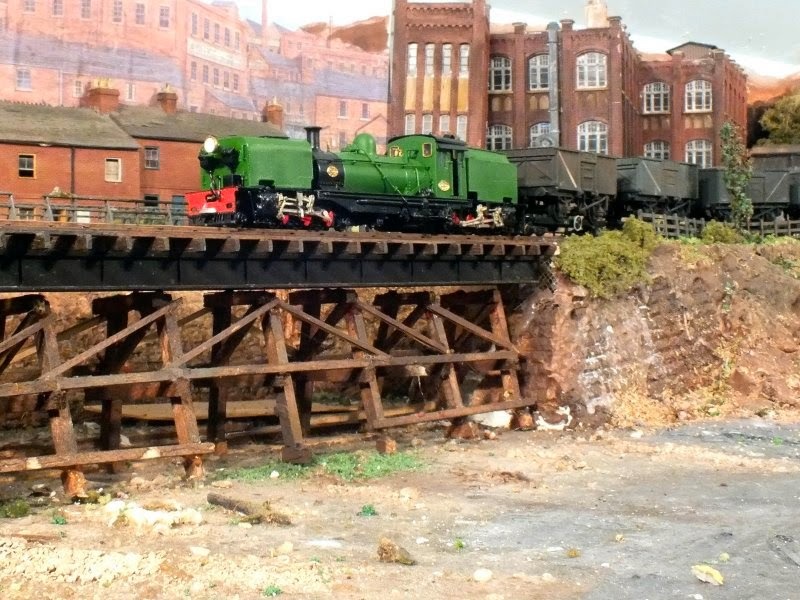 Because of the size and success of this super event, they are unable to show off their own layouts so, every couple of years they get together with some additional invited layouts from relatively local modellers to have a small, informal and very enjoyable little show of their own. To round off a splendid day out for all those who like this type of small specialist event, the Glastonbury Lions ladies provide a fantastic array of world class cakes. The Great British Bake Off TV competition pales into insignificance compared to a Glastonbury Ladies Victoria Cream Sponge! 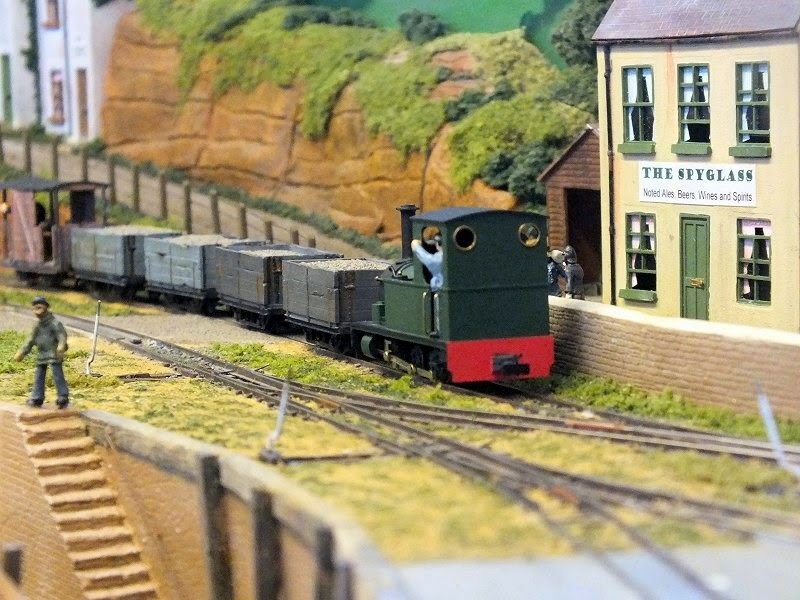 14 narrow gauge layouts, covering all the main scales – a really splendid and enjoyable feast of modelling (and cakes!). 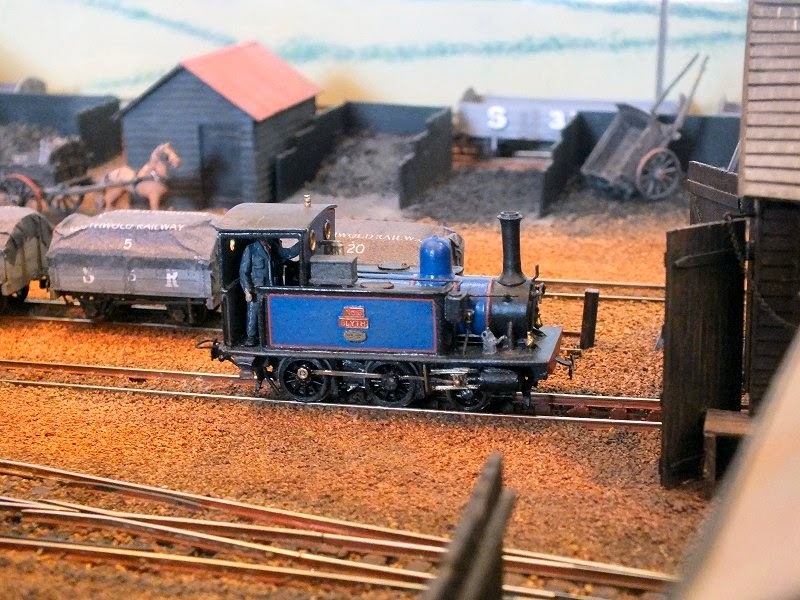 The first of 2 narrow gauge modelling events this weekend saw the “009 Society Road Show” making tracks to Steventon, near Abingdon, for the 2nd biennial open day organised by Richard Holder and fellow members of the Oxfordshire NG Railway Modellers. A splendid location, including a cricket match on the green outside the hall and absolutely outstanding hospitality and organisation by the Group inside the hall! 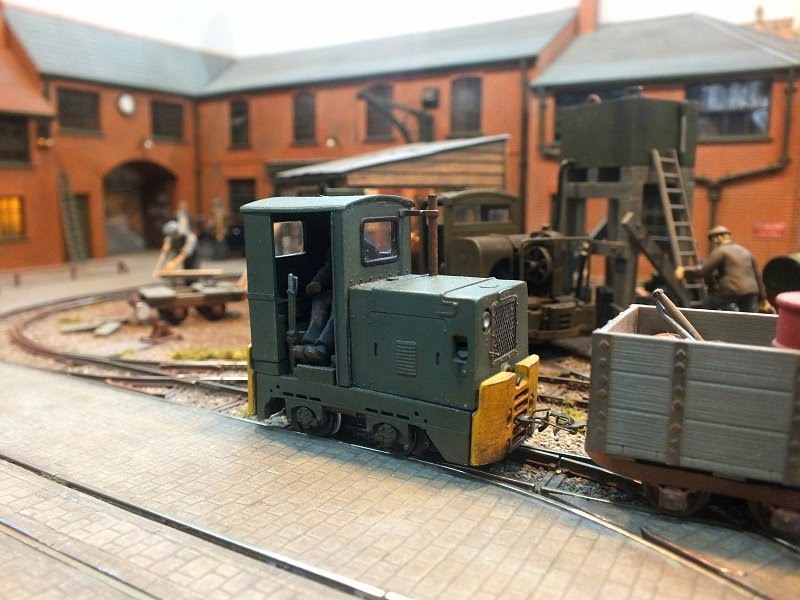 There were14 top quality layouts, a good selection of traders plus a very well stocked 009 Society sales stand and excellent 5 star refreshments. 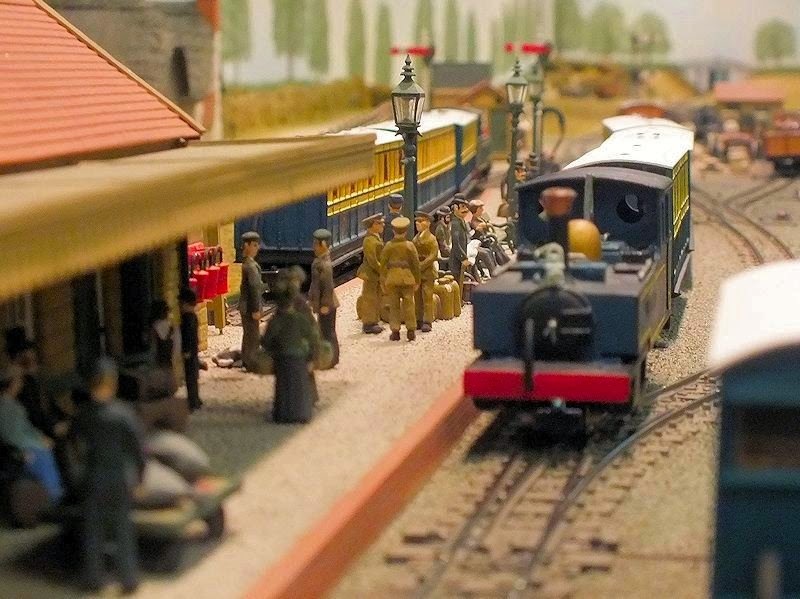 It was a super day, spent in friendly company and just the right start to a full weekend of modelling excellence! 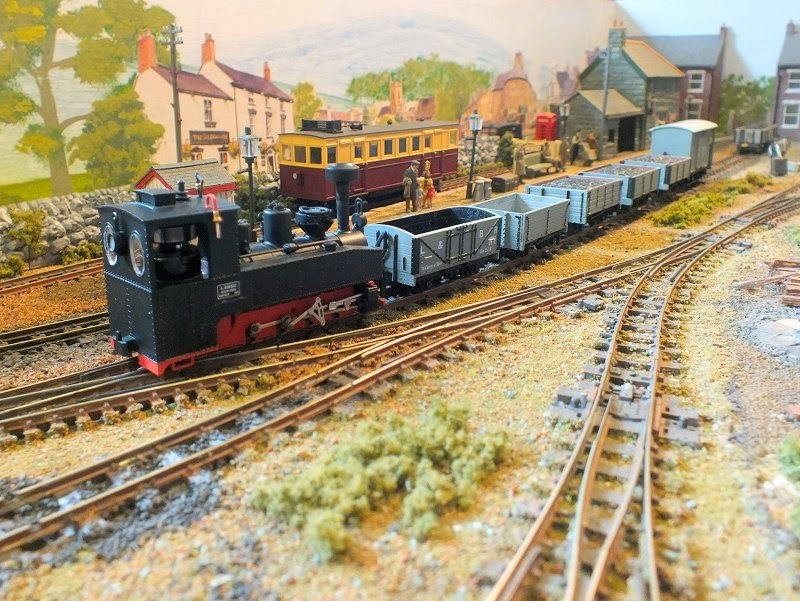 All too soon, it was time to pack up the sales stock, Rod Allcock’s Corris layout and A1 Models, all appearing at both events, and a number of 009 Society members headed north towards the Sunday event at Mansfield. 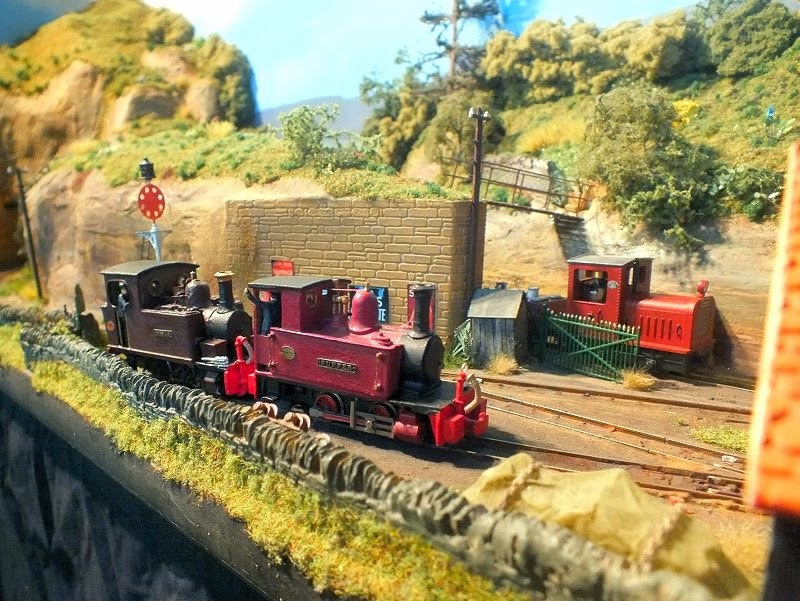 "Small Wonderful Industrial and Narrow Gauge", which is quite a mouthful but actually very descriptive of what this little event is all about. 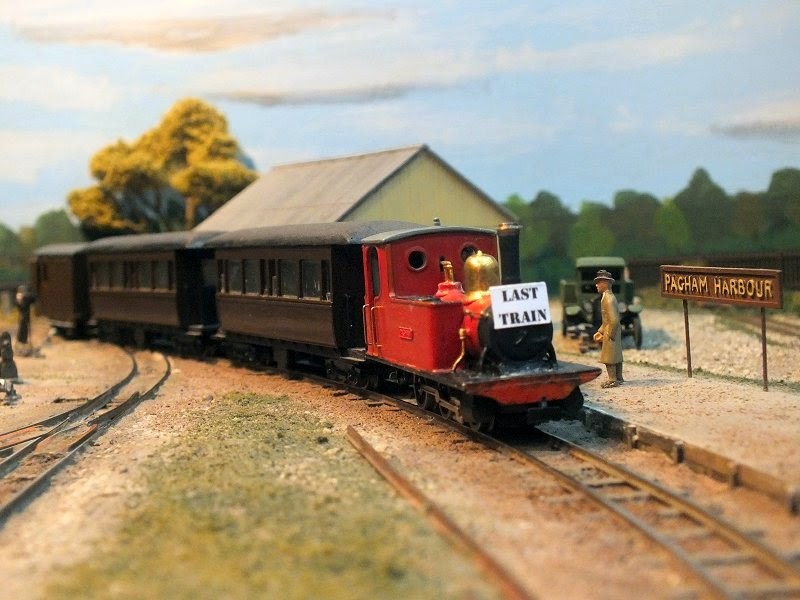 Organised by the South Downs Group of the 7mm Narrow Gauge Association, I expected the event to be awash with 7mm NG and nothing much else, but I was very wrong as actually there were only about half the layouts in the 7mm NGA own favoured scale range, the other half containing five 3½/4mm plus one each Sn2 and BIG 7/8" scale layouts as well as a 5/7¼" dual gauge steam powered kiddy ride outside on the lawn. Overall it was a splendid, informal and friendly day, in the best tradition of members days and it was very well attended by narrow gauge enthusiasts, some of whom had travelled considerable distances to join in. This was the 6th annual SWING event but my first, I certainly don’t intend it to be my last! Another extremely wet and windy start to the year as Brian Guilmant and myself loaded flares and lifejackets into the 009 Society Salesmobile and set forth into the waterworld that parts of Somerset had become. Our destination, Ilton, is very near the flooded Somerset Levels and at times the A303 heading west from Yeovil was a bit like a causeway across a giant lake but we navigated a dry route and got there safely, as did a good number of narrow gauge enthusiasts, ready to enjoy the 8th South West Group 009 Society Members Open Day. 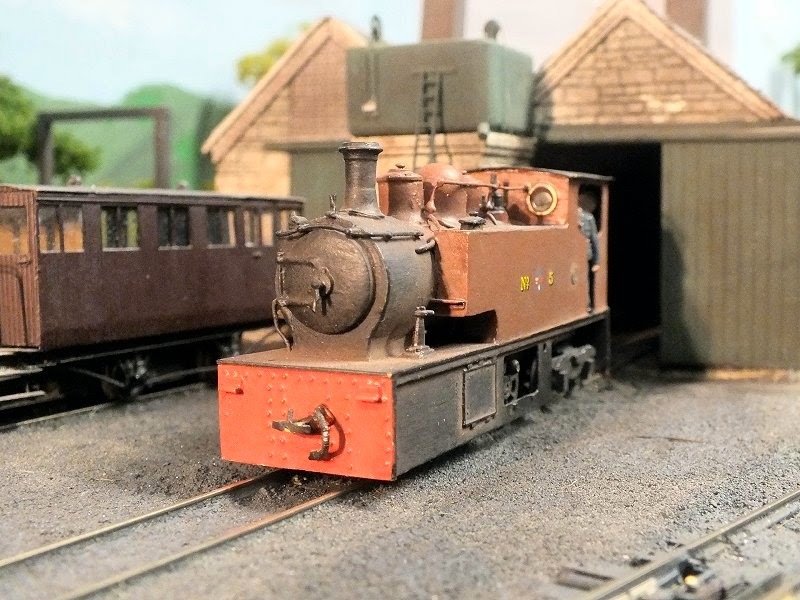 Once again Matt and Maria Cicquel came up from the Devon Railway Centre and provided 5 star beverages and food including some splendid hot “oggies” whilst everyone enjoyed the usual informal, relaxed and friendly gathering amidst an entertaining variety of models provided by the host group and friends. Well done to all the SWOONS team for an excellent event. A long time ago Tim Sanderson invited me to visit his home in Haywards Heath and take some photos of the Elmgate & Thatcham. Eventually the opportunity arose in September 2013 and just 2 weeks after my photo session at Brian Guilmant’s home, I found myself visiting Tim at last. 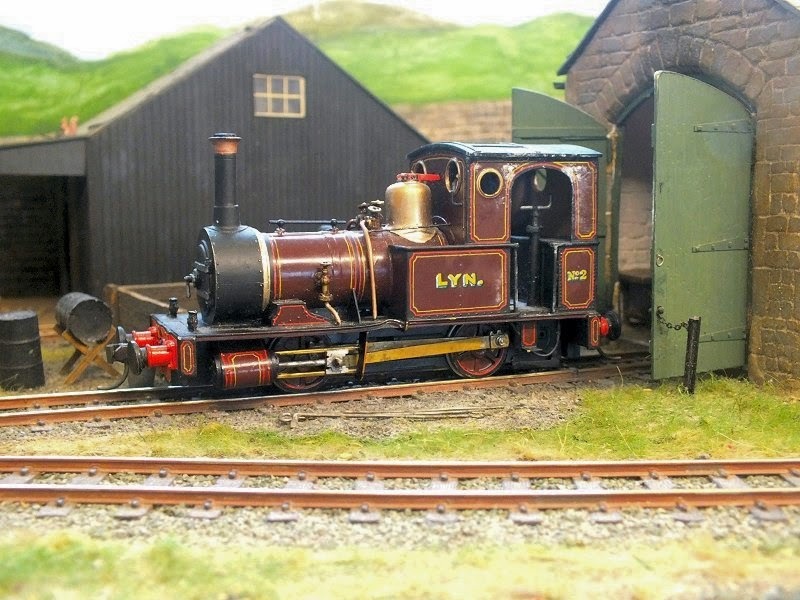 I have been an admirer of Tim’s innovative and imaginative modelling since I first read about his “Jintybash” locomotives in Railway Modeller January 2000 and subsequent articles on converted TT goods vehicles and Meridian Ashover coach modifications in the July 2001 and August 2002 issues respectively. 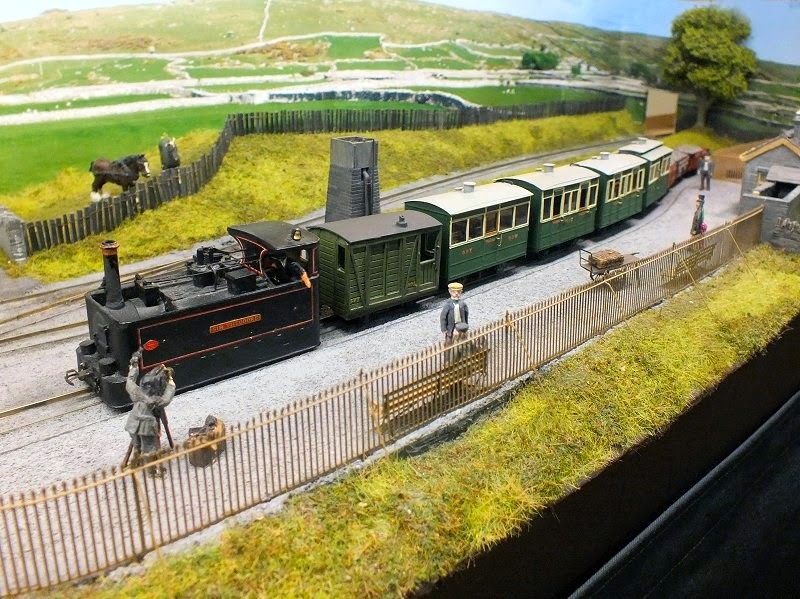 This is a portable layout built for exhibitions and operation and is a complete contrast to Brian’s Imperial Western in the previous report. As I couldn’t publish results of my photo session at the time, I thought it appropriate to put it in here as a fitting finale to my 2013 outings with the camera. I hope you agree! 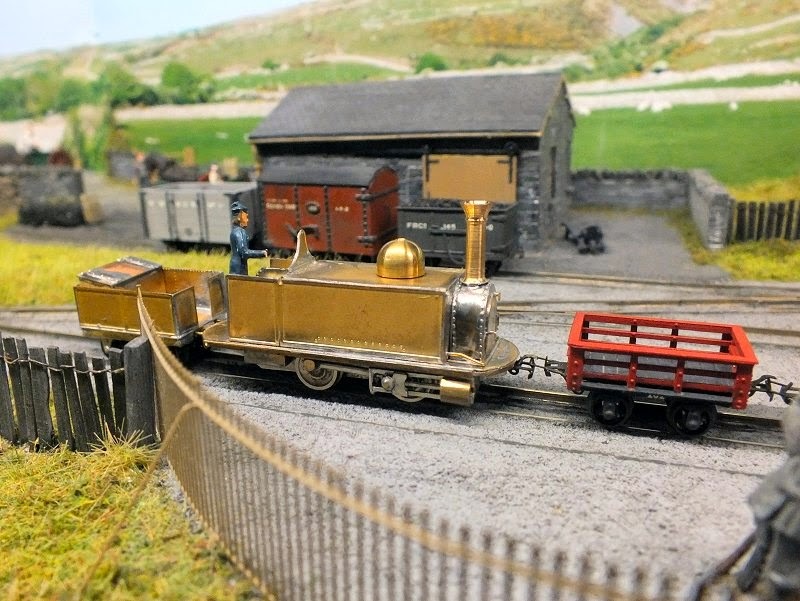 I mentioned in the report on the Member’s Morning on 14 December 2014 (the previous report in this blog) that, in addition to organising a mini-exhibition in his local community hall, Brian Guilmant had also invited visitors to see the fantastic narrow gauge empire that he has been building in his 30ft x 14ft converted attic. As can be appreciated I’m sure, taking photos of a home layout visit with a number of people present can be “challenging”, so I thought it entirely appropriate to cheat a little here and insert a record of a special invitation that I had from Brian 3 months earlier, in September, to take a set of photos of the layout which he used some of in his article that was published in 009 News issue for December 2013. Here then is my own guided tour of the world that exists in Brian’s Attic! Following the success of the Members Morning in Colehill in 2012, Brian Guilmant, hired the Colehill community hall a hundred yards from his home and organised another one for 2013, to the same recipe as the previous year: a selection of invited layouts, complete with the 009 Society sales stand, bacon rolls for breakfast and soup and rolls for lunch, a visit to Brian’s fantastic narrow gauge empire in his attic and for the Wessex NG Modellers members and invited guests, their own Group Christmas Meeting in the afternoon. Another very successful day, if exhausting for the organiser! Lots of people made the journey, some travelling considerable distances. I had to leave at lunchtime, but everyone that I spoke to during the morning told me that they thought it was a splendid little do and a very enjoyable way to spend a Saturday morning!